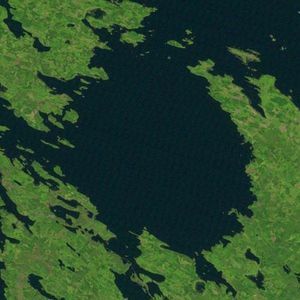 Paasselkä is an oval-shaped lake formed in an eroded impact crater in Southern Savonia, Finland. The lake, which is a part of Orivesi, which is in turn part of the Greater Saimaa, is devoid of islands which makes it different from other lakes in the region. Paasselkä is also unusually deep, 75 m at the deepest point. The Paasselkä impact occurred about 231 million years ago and affected Paleoproterozoic crystalline rocks and some overlying sandstones of the Baltic Shield. Because of the unusual shape and associated magnetic anomalies, Paasselkä was suspected to have an impact origin long until it was confirmed after a deep drilling in 1999 making it the ninth known impact crater in Finland. Unlike many Finnish craters, it does not seem to have been buried under layers of sediment.